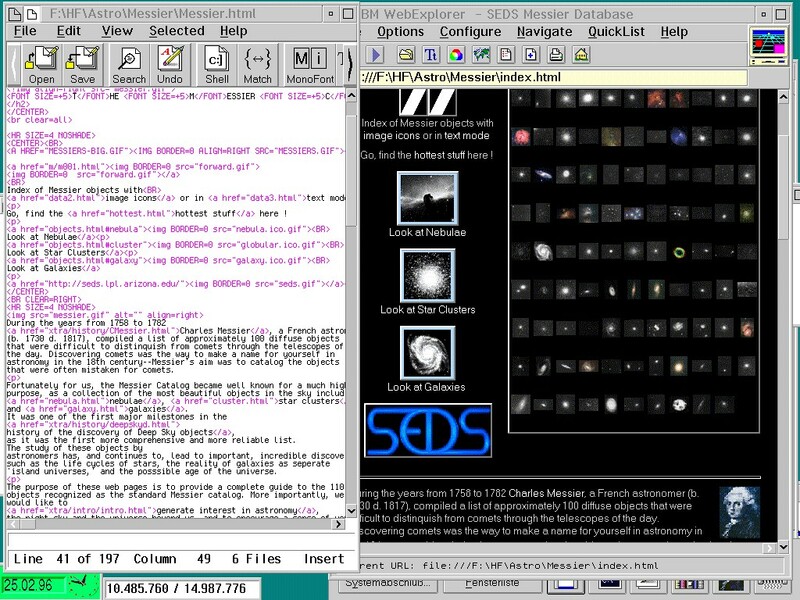 Overlaid over the workplace is, on the left, the OS/2 Enhanced Editor EPM where a HTML file is edited; HTML tags are highlighted (this can be configured for the job you are currently editing). On the right hand side, the file under work is viewed (or previewed) with the WebExplorer. For online viewing, it is possible and IMHO more convenient to make the WebEx window larger. You may also select the presentation mode of WebEx, which uses the full screen for Htlm viewing. On the Workplace Shell desktop, but under the two windows mentioned, some system utilities (clock, disk usage info, and clickbar at the bottom, as well as some underlying windows and utilities which are just visible at the left and right edge. This capture may give a suggestion of the working comfort under this system. Contact me if you have any additions and/or comments.